2-Step Round Dance lessons for all dancers - from the beginner to experienced. 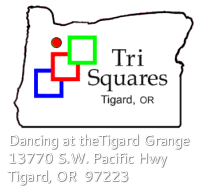 Since the moves in Round Dancing are different than in square dancing, you do not need to know how to square dance in order to learn to Round dance. Round Dancing is a form of social ballroom dancing for couples (or pairs) in which the steps are choreographed precisely to a specific piece of music, and those steps are announced by a "cuer" as the dancers move in a counter clockwise pattern around the dance floor. The presence of the cuer makes a round dance look different than the usual ballroom dance as all the couples are dancing in unison. In round dancing each piece of music has a specific routine (steps) written for it. The “cuer” guides the dancers through the figures in each routine, thereby eliminating the need for the dancers to memorize a specific pattern. The presence of the cuer relieves the pressure on the lead (male) dancer since he does not have to think up what steps to do next to keep the dance interesting to him and his partner. Choreography in round dancing can be relatively simple or be somewhat complex. It just depends on the writer of choreography for that particular song. Round dancing is performed to a variety of music and to familiar rhythms such as the 2-step, waltz, cha-cha, rumba, and many more. Also, many of the rhythms previously mentioned share moves. This make it simpler and quicker for the dancer to learn (pick up) another rhythm or syle of dance.